General James Shields with 7,000 Federals defeated Stonewall Jackson with 3,500 Confederates. Jackson's object was to create a diversion which would prevent troops being sent to McClellan for the attack on Richmond. He arrived south of Kernstown in early afternoon Sunday, March 23, and attempted to turn the Federal right flank. To counter this, Colonel N. Kimball who succeeded to command after Shields was wounded March 22nd, advanced Colonel E.B. Tyler's brigade. Savage fighting followed for possession of the stone wall separating Jackson's and Tyler's troops. Seeing that Tyler was hard-pressed, Kimball rushed reinforcements from his and Sullivan's brigades. The Federals turned the Confederate right, and General R.B. Garnett with his ammunition running short fell back without Jackson's orders, exposing Colonel S.V. Fulkerson and forcing his withdrawal. Colonel J.S. Burks reached the field in time to check the Federal attack and cover the Confederate retreat from the field. This was Jackson's only defeat. Erected 1964 by Virginia Civil War Commission. Standing next to the marker. 39° 8.403′ N, 78° 11.679′ W. Marker is in Winchester, Virginia, in Frederick County. Marker is on Opequon Church Lane, on the right when traveling west. Touch for map. Located in front of the Church in the north side parking lot. Marker is at or near this postal address: 217 Opequon Church Lane, Winchester VA 22602, United States of America. Touch for directions. Other nearby markers. At least 8 other markers are within walking distance of this marker. Kernstown Battles (here, next to this marker); a different marker also named Battle of Kernstown (here, next to this marker); Opequon Presbyterian Church (about 300 feet away, measured in a direct line); In Memory of the Many Soldiers of the Revolution (about 300 feet away); 1790 Stone Church (about 300 feet away); The First Battle of Kernstown (approx. 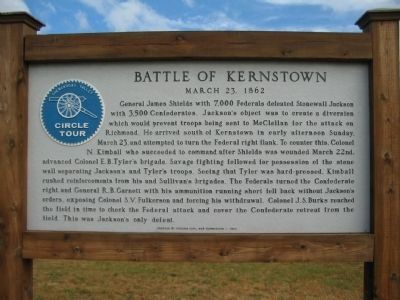 ¼ mile away); The Second Battle of Kernstown (approx. 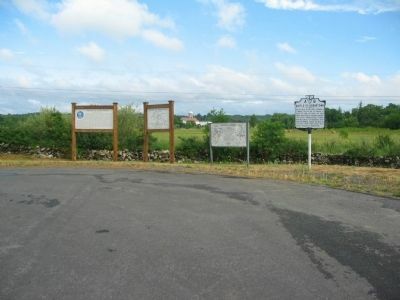 ¼ mile away); a different marker also named First Battle of Kernstown (approx. 0.3 miles away). Touch for a list and map of all markers in Winchester. More about this marker. This marker is part of the Shenandoah Valley Circle Tour. More. 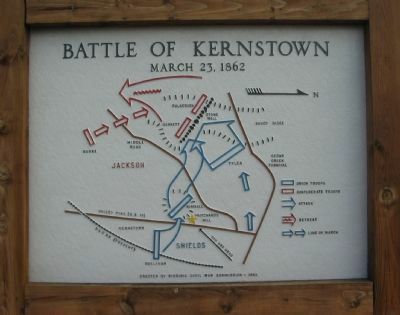 Search the internet for Battle of Kernstown. Credits. This page was last revised on June 16, 2016. This page originally submitted on July 13, 2010, by Craig Swain of Leesburg, Virginia. This page has been viewed 1,239 times since then and 20 times this year. Photos: 1, 2, 3. submitted on July 13, 2010, by Craig Swain of Leesburg, Virginia.